I added an LCD screen to my DUE project and have a problem with having to hit the reset button on power up to get the screen to show my coded buttons. I added a resistor to the DUE when I first bought to alleviate this problem per numerous threads on google and on the forum and all has worked well for the past year until I added the screen. The code runs without the screen but the buttons on the screen are going to add variables to the code to make it run different patterns. Is there a way to code in a reset so I don't have to hit the reset button all the time? Can I buy a DUE that doesn't have the problem of the added resistor? BTW, a small capacitor betweeen the reset pin and a Gnd pin solves the issue. I do have a screw shield that I'm using, similar to this one but same functionality. What size capacitor do you suggest? I followed the resistor instructions from an extensive thread on this forum to get it to work the first time but didn't see anything about adding a capacitor, is there one for a capacitor? Just asking because I'm pretty new to electronics. Awesome, thanks for the link. I updated my board with the resistor and capacitor and the LCD screen now comes up when power is turned on but now I have a hall sensor that keys all the movement of my steppers that doesn't seem to be working on power up. I have to hit the reset button and hold it for a few seconds to get the controller to read the sensor for some reason. In the serial window on startup the hall sensor(it counts turns) shows going to 1 because the magnet is off the sensor but doesn't count any more turns than that until I hit the reset button as explained above. Anyone have any thoughts at where to look. Does the hall Sensor works properly if connected alone on the board ? It worked before I added the LCD screen & resistor/capacitor. I uploaded a sketch without the code for the LCD screen and had to press the reset button after upload to get the controller to see the hall sensor, once reset is pressed it works properly. The same thing happens when I add the LCD screen, I have to hit reset for the hall sensor to work. I have 4 other hall sensors inputing to the controller that don't have a problem(they work on power up without any problems). Adding the resistor and Capacitor allows the LCD screen to launch with no problems as it didn't before without a reset. I also get a com error when trying to upload a sketch now, I connect the serial cable to upload and then I have to hit the reset button for a few seconds before I can upload a sketch. Post a full sketch with the "faulty" hall sensor alone. I have bought an authentic Arduino.cc made in Italy and started to test it to see how it reacted to different sketches. 1. the new board doesn't have a problem with uploads, it erases itself and uploads a new sketch without having to manually erase and reset before upload like the other board(I didn't have to manually erase old clone board before adding cap/resistor). 2. After uploading sketch or power on to the authentic board the LCD screen doesn't launch without pressing reset button. 3. I tried adding the resistor to T3 Mosfet to alleviate problem on LCD with authentic board and then had to do manual erase and reset to upload sketches from that point on and had to reset after power off/power on cycle. 4. I also tried the cap/resistor cure on the post you referenced earlier and ended with the same problems that the Mosfet cure had with uploads and power on's. 5. I also tried to flash the 16u2 on the old clone board but just kept getting verification errors and not sure if it flashed or not but symptoms persist still. 6. If I upload the blink without delay sketch on either board it always works after cycling the power on and off, so maybe my problem isn't with the boards. I can upload the code but not sure exactly what you are looking for, I will add the code for the hall sensor without any screen or motor code which is what I think you are looking for. Here is the full code in case you have a question about how it is used. 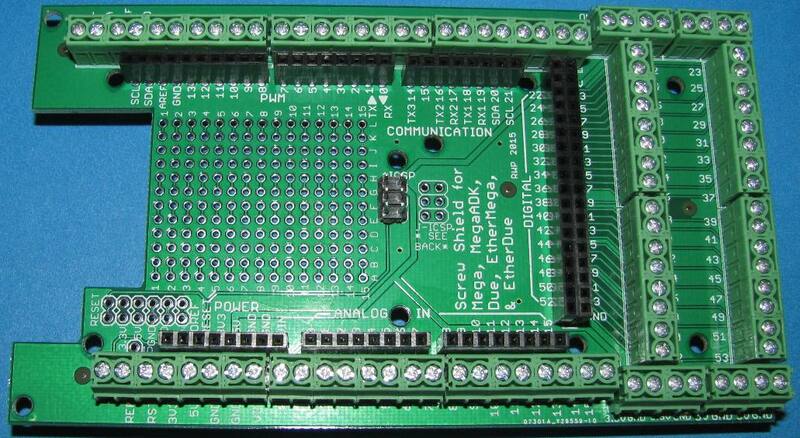 // Default values for Adafruit shield v2. // x coordinate of 100 doesn't seem right, but it works. I think I got it figured out. After deciding that maybe the problem wasn't with the Due I searched for LCD screen not launching with the due and found a thread on the forum discussing the issue. Some genius with electronics stated that the LCD screen needs more time to initialize than the controller allows it to do and put a delay at the top of the setup and see if that allows the screen to launch. I have tried that and it seems to have worked so I will continue to test it to make sure it is truly the fix for me. That did the trick, set a delay(300) at the top of the setup and everything runs great without adding anything to the board. Thanks for the help ard_newbie.